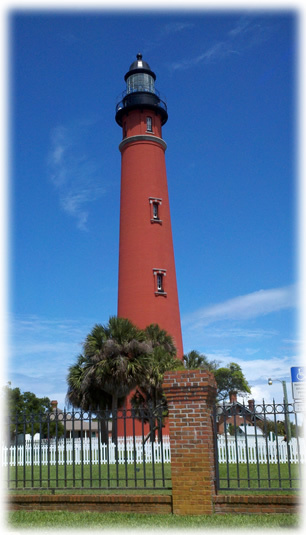 Completed in 1887, the Ponce de Leon Inlet Light Station was built when the area was known as Mosquito Inlet. After decades of restoration by the Ponce de Leon Inlet Lighthouse Preservation Association, it stands today as one of the best preserved, most complete Light Stations in the nation. The Ponce Inlet Light Station is open daily from 10 a.m. until 5 p.m., Labor Day until Memorial Day. After Memorial Day, the Light Station will be open from 10 a.m. until 9 p.m. The Halifax Historical Society was founded in 1949. The mission of the Society is to gather and preserve the history of the Halifax River area and present it to the public in an interesting and educational manner. Visitors often comment that this museum and it's impressive collections are one of the best kept "secrets" in the North Central Florida area. The Marine Science Center is an innovative learning experience where visitors can discover, enjoy and appreciate the many wonders that embody the world of marine science in Volusia County. Of special interest is the endangered and threatened sea turtle exhibit. A separate pavilion has been converted into a sea turtle rehabilitation laboratory. A boardwalk and nature trail system extends throughout the park to allow for public wildlife and habitat observation. Hours: Tuesday - Saturday 10 a.m. - 4 p.m.. Sunday 12 p.m. to 4 p.m. Closed Monday. This popular multi-use facility hosts a variety of conventions, tradeshows, concerts, banquets, family entertainment shows and sporting events. Check us out! Whether your favorites are the nutty Honeybees or the Chocolate Butter Creams, or even a specially-molded chocolate for your clients, you are sure to find the highest quality in fine confections at Angell & Phelps Chocolate Factory. Learn to fly! With our tandem skydive, you will be in freefall for approximately 60 seconds, and skydive from our usual altitude of 13,500 feet. You will then enjoy a 5 to 7 minute canopy flight with a spectacular view of Kennedy Space Center as you've never seen it! Also offering Accelerated Freefall (AFF), and Tandem IAF Progression.